Your child may wear 2 different outfits if they can quickly be changed. Some babies tend to get very upset when changed and could take some time to calm down so please keep this in mind with this being a “mini” session. Children should arrive already dressed and ready for the 1st setup and bring an additional dressy holiday outfit or holiday themed pajamas. Please let me know if you would like any help choosing outfits. 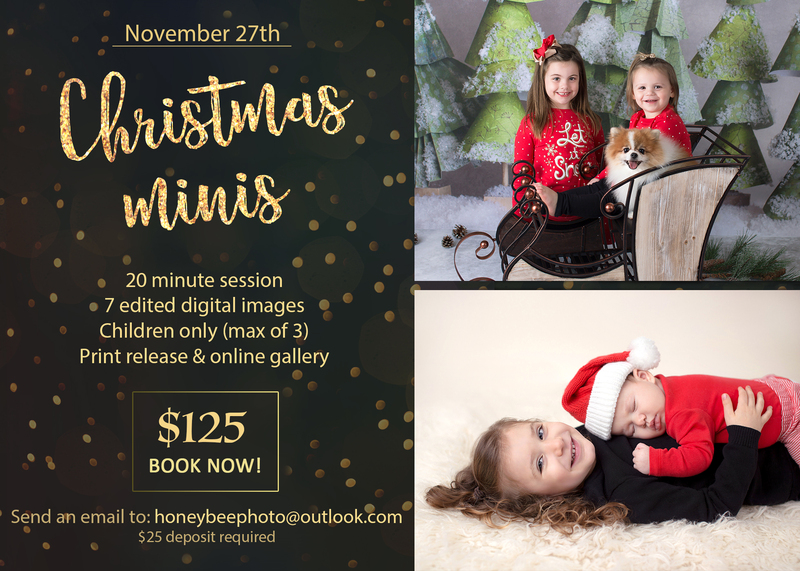 Spots are limited, so please send an email to honeybeephoto@outlook.com if you would like to book. A $25 non-refundable deposit is required and the balance will be due on or before November 27th. © 2019 Richmond Virginia Family & Newborn photographer | Honeybee Photography|ProPhoto Photographer Template | Designed by That's Kinda Cool!